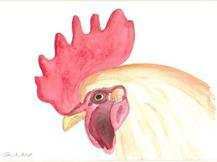 A simple but effective small watercolour of our stud cockerel, "Lucky". He lives with up to 80 hens at a time and keeps them in order when squabbles start. He has a lovely character, which comes through in this painting. Painting is mounted and framed and measures 33 x 28cms.